This much delayed scary movie from talented new director Troy Nixey and the man with his name on the marquee Guillermo del Toro is based off a TV movie from the 70's apparently. 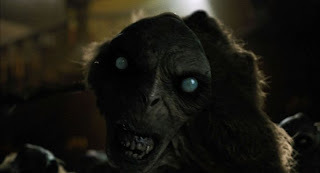 Not that this little fact really matters, but it is interesting to note Del Toro's involvement in trying to somewhat bring his much acclaimed style from "Pan's Labyrinth" to this genre by stepping in as co-writer and producer while ultimately delivering a product that seems more a distant relative to his previous work rather than immediate kin. 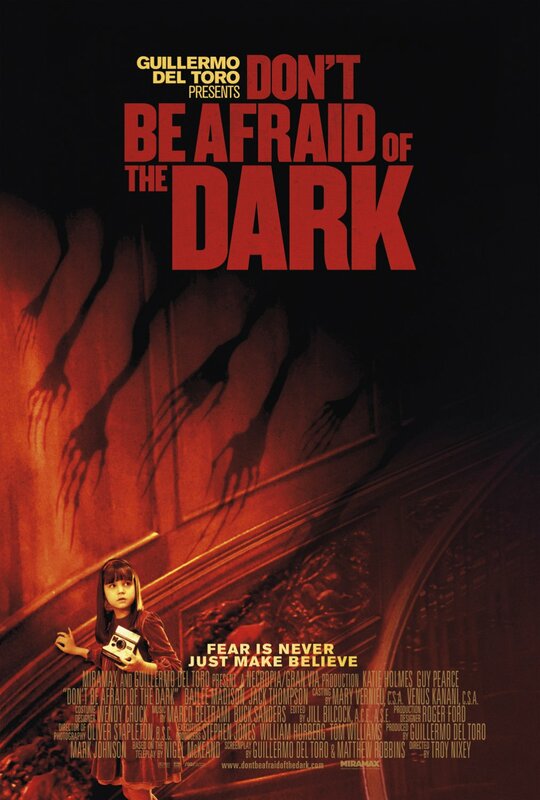 "Don't Be Afraid of the Dark" has all the elements of a great horror film, even Nixey has the right ideas, the right sense of tone and a great visual eye, but the story in no way is good or original enough to bring these separate elements together in a coherent work that truly frightens the audience. Hell, this production even has grade-A credible actors (and though some may disagree on the Katie Holmes factor I've always thought her a quality talent). The normally selective Guy Pearce plays the most archetypal of characters here while Holmes actually spreads her wings rather nicely. 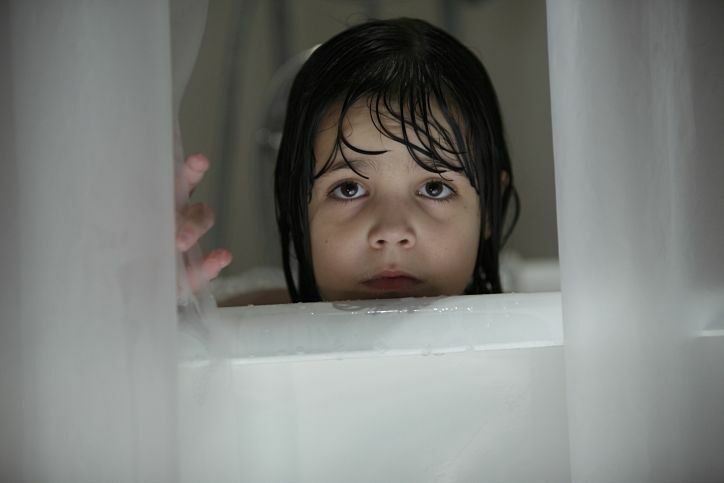 It is the films real star, Bailee Madison though that makes all this fuss about little gremlin-like creatures and not being scared of turning out the lights even worth your attention. keeps heaing throughout her dad's new house. The story is simple enough, something terrible happened in this lovely Victorian mansion many years ago and no one has bothered with it since. Flash forward to present day where an architect and his younger girlfriend, an interior designer, are trying to restore the old place. Cue the introduction of the architects daughter from his failed marriage. Why little Sally (Madison) is shipped from her mothers to live with her dad and new girlfriend is never really explained, but there are several hints at an unstable mother who couldn't handle the responsibility. A connection through this mysterious aspect of the family and the history of the house might have been intriguing, but like I said, the script doesn't really try hard enough to convince us of the creeps it just expects us to react to the average, yet perfectly set-up scare tactics. "Don't Be Afraid of the Dark" looks great and has truly gorgeous art direction. The tour of the old mansion we receive throughout the film warrants the price of admission alone, but as far as the film working as a scary movie this feels more been there, done that than it does fresh haunted house tale. And after "Insidious" earlier this year, this seemed nothing more than child's play. frightened by what haunts their new house. The highlight of the film is the natural way in which the relationship between Sally and Holmes' Kim develops from an awkward daughter and dad's girlfriend relationship to Sally feeling as if Kim is the only person in the world she can trust. Young Bailee Madison is a gifted actor and is one you probably recognize from countless other movies and TV shows you've seen. Madison anchors this whole, heavy film on her little shoulders and creates what sense of fear this film does conjure up through her brilliant reactions to the little CGI monsters. With Holmes as well stepping into the standard stepmother role and turning it into a sympathetic woman who truly yearns to create a real connection with Sally allows for the movie to move beyond being just a scary movie, but one that explores themes of the human psyche and why that human connection is a necessary part of life even if our instinct is to initially distance ourselves as far from society as we can, to the point we don't have to face the truth about ourselves or our situation. That seems to be both what Sally and her father are doing. Attempting to wrap themselves up in their interests or work so as to stray away from the real issues that are happening in their lives. Too bad the script decides to leave these avenues unexplored as well. To have seen a reflection of our possible futures in these characters would have been the scariest thing of all, but heaven forbid a summer film try to teach us a lesson. Instead, "Don't Be Afraid of the Dark" lingers far too early and for too long on the little furry creatures to actually cause the audience to fear them. Their entire mission of trying to get little children's teeth is never looked into either. We get a little history on the ancestry of the species via the cliched old documents in the local library, but why teeth? And why specifically children's? We will never know. I certainly don't intend to go looking for the original on which this based to find answers, this update should have worked harder to answer them for me. There isn't even any intrigue in leaving these questions unanswered. It's just annoying. Parts of the film can be forgiven due to the caliber of acting Del Toro and Nixey have assembled here, as well as for the captivating art direction, and the editing is particularly effective, but besides that one frightening, jump out of your seat scare we already witnessed in the trailer there is no reason to go see "Don't Be Afraid of the Dark". So, granted, this film works on some levels the fact of the matter is it doesn't on the one it touts as its bread and butter and for me, in the end, that counts for something. It counts enough for me to say wait for a good, stormy night when this is on DVD and rent it. Only then might it come off as the scary movie it coulda, shoulda been.